As promised, the yarns from the Field of Tulips Cowl are making a reappearance (and yes, that means that those three skeins will get you both of these cowls, plus whatever I decide to make with the leftover reddish one). 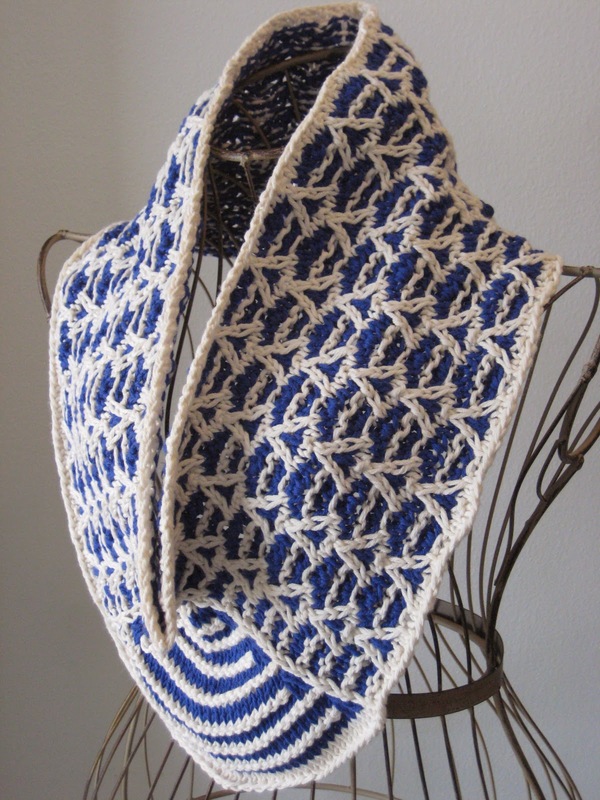 And for this pattern, I mixed a slipped stitch triangle pattern with an overall triangle theme for an effect that's a bit tribal and of a larger size (when folded in half, which is how I blocked it for the crease effect, the piece measures about 15" along the neck and 20" along the bottom). Overall, it's also a pretty striking knit, and reasonably fun to make as well. 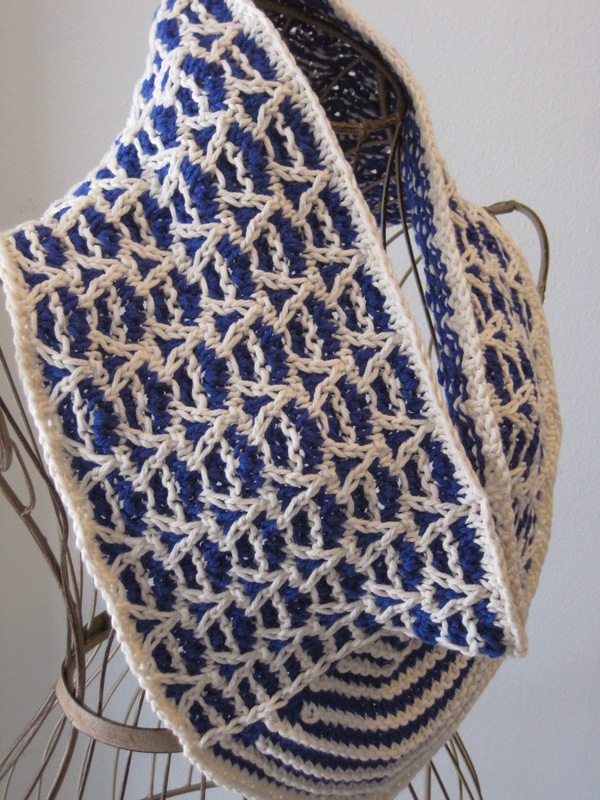 And now, let's move on to the main pattern, which is a combination of Chain of Triangles from page 100 of Barbara G. Walker's A Second Treasury of Knitting Patterns and another slipped stitch pattern. So let's keep going! Knit rows 1 - 8 twice through, and then bind off loosely, purling the purl stitches and knitting the knit stitches. Tuck in ends and block to prevent from curling. The triangle pattern at the bottom. 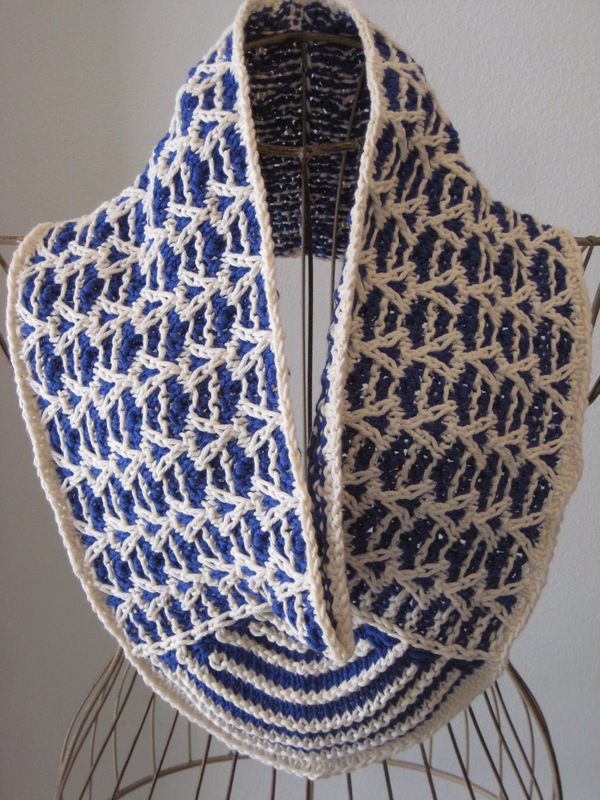 Oh what a beautiful project, Im going to knit this! Hi! This pattern is beautiful! I really want to make it as a gift for my sister. Do you mind if I ask a few questions about it? 1) As far as the two colors go, how do you deal with switching from one to the other? 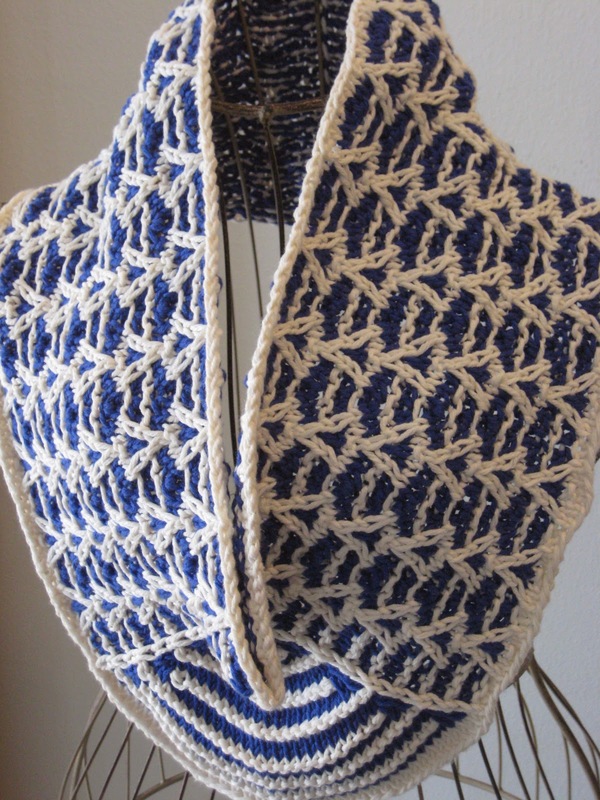 Do you just have lots of weaving in strands at the end (that can't be right) or do you hold in back somehow? I'm sorry. 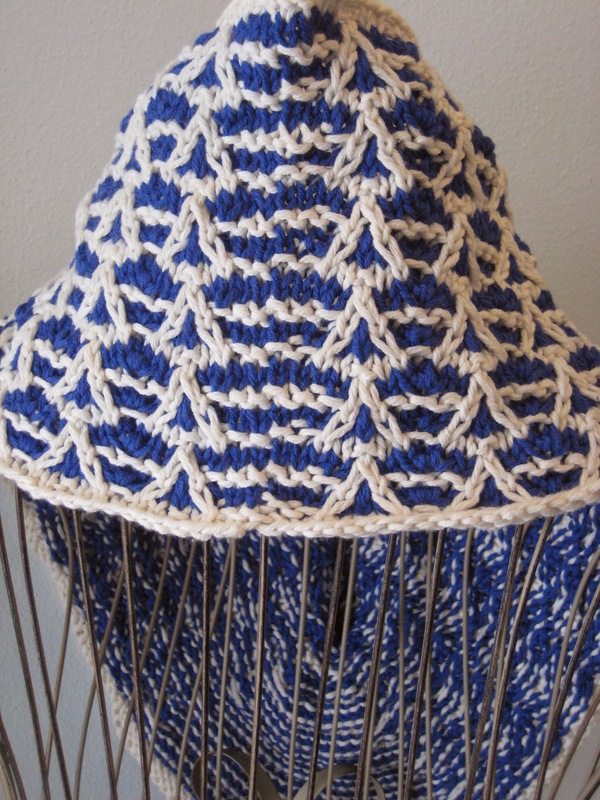 I've never done a pattern like this, so if you could link to a video or just give me the name of the technique I can google it. 2) Can you explain what "slip 1, k3, slip 1, (k1, p1, k1) into next stitch" this means, specifically the "into the next stitch" part. I know the abbreviations and everything, I've just never seen that prhasing in a pattern before. Does it mean to k1, p1, k1 into one stitch before dropping it from the left needle? Also, I wanted to tell you that I've made FIVE pairs of your Staghorn Fingerless Gloves for all the women in my family. Love your website! Hi Jennifer! I'm glad to hear that you're enjoying my patterns. :) And I've answered your questions below! 1) I hold the colors in back and work them when needed. I know I've found web tutorials on this before, but I'm not coming up with any of them now. Basically, you just want to twist your colors around each other so they lie neatly and without holes. Oh, here's one that shows the back: http://www.purlsoho.com/create/2008/03/09/stripes-in-the-round/ Maybe that will help? 2) The (k1, p1, k1) in next stitch is, indeed, an increase where you turn one stitch into three. So it sounds like you have it exactly right - k1, p1, k1 in one stitch and then drop it from the needle! Thanks so much for responding. I'm going to my local yarn shop tomorrow to get started on this project! Hi! I finished knitting this. It knitted up a lot faster than I thought it would. I need to block it as you suggested in the pattern. Can you give me any suggestions as to how you blocked it out. I want it to fit well on the shoulders and neck. Hi Jennifer! I soaked it in cold water for about 20 minutes, then squeezed/patted it a bit dry with a towel (just don't twist or wring it!). Then I simply folded it in half down the middle (so my fold was at the back seam and right through the middle front) and pinned it on a towel to dry flat! Thanks so much! I'll do that tonight! I’ve been in love with this cowl for quite awhile. Finally working up courage to try it. I have some 100% pima cotton yarn that I’d like to use. It says the gauge is 22-24 stitches =4” on us 5-6. I was using the yarn to make sweater and used size 7 but I’m assuming I’d need to increase number stitches. Could you help me? Glad to hear you're ready to get started. :) And I think you have a lot of flexibility with options here - I'll outline three of the ones that seem the best to me! 1) First, and easiest - you could use size 7 needles and just cast on as written - the cowl will be a bit smaller, depending on your exact gauge, but should still be plenty big to fit over your head, etc. 2) If you want to maintain more or less the same size, then you can use size US 6 needles, cast on 36 more stitches, and divide them as follows: "K81, place marker, k40, place another marker, and knit until the end of the round." (I wouldn't change the number in the middle; the difference in scale shouldn't be terribly noticeable and you can always add length at the end if you'd like if it's a bit shorter). 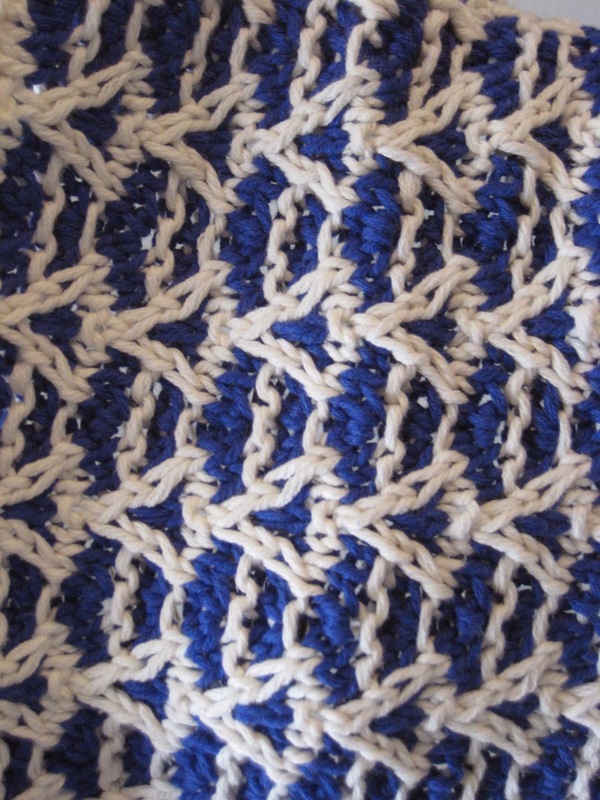 You should be able to follow the pattern with that stitch distribution. 3) (and sort of most complicated) You could add a different number of stitches - either 12 or 24, and then distribute them on either side of the middle bit evenly (so put 6 or 12 before the first marker, then 6 or 12 after the second). 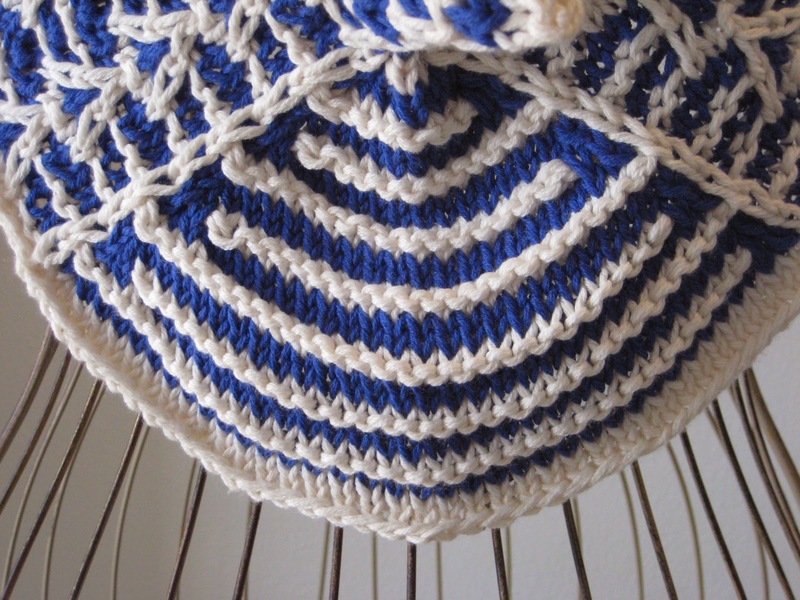 This gives you a bit more flexibility if your gauge is more like 20 stitches per 4 inches.